From a humble home Ganpati to grand public celebrations, how Greater Noida’s oldest Ganpati Puja is reminiscent of Tilak’s real initiative! The 10 day long festival of Ganpati Mahotsav is being celebrated with much joy and fervor at different parts of India. What started as a humble, single place celebration in Pune has spread throughout the country with installation of millions of idols, throughout the length and breadth of India. It was Bal Ganga Dhar Tilak who in 1984 transformed the household worshipping of Ganesh into a grand public event- Sarvajanik Ganeshutsav. The celebrations consisted of several days of processions, music and food. They were organized by the means of subscriptions by neighborhood, caste, or occupation. Following the same path, Greater Noida resident Chandrashekhar V.Garge started with the installation of Ganesha idol during Chaturthi at his home, some 18 years back. He would then invite friends and neighbors to become part of festivity. Gradually the worshippers increased and the celebrations moved to a nearby park, then to a bigger ground in Beta-1 and finally to its present place of organization. What started as a humble private event has now become a full-fledged ‘Sarvajanik Ganesh Utsav’- probably the biggest in the district. At its current place of organization, the festival is marked with 10 days of cultural extravaganza. Devotees throng in hundreds and thousands to witness an impeccable blend of Maharashtrian culture with North Indian touch. 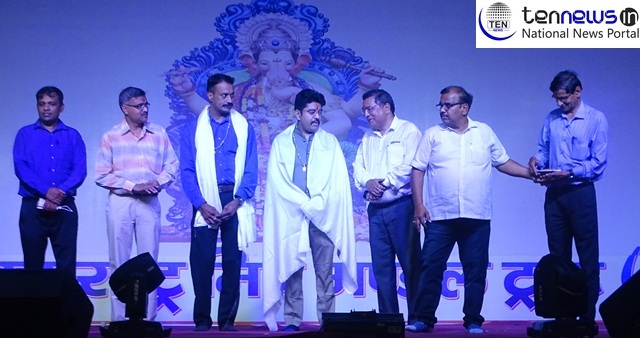 A visit at this Ganesh Pandal to take the blessing of elephant headed God would not be complete without getting submerged in the amazing cultural events that are organized here at a large stage here, every evening. There is also food, ferry rides, ethnic shops, handicraft vendors among others to complete the feel of a full-fledged Indian ‘mela’. The festival has also provided an opportunity to local crowd to get a taste of Mahrashtrian culture. Many dance and music enthusiasts from the city also learn and present Maharashtrian song and dance during this 10 day long festival. This year the celebrations started on 13th of September and will go on till 23rd September. So don’t miss the chance and come take the blessings of Vighnaharta at this make shift ‘mini-maharashtra’ of Greater Noida.